I asked Cleverbot about what's chasing the Vasari and . . .
"What is chasing the Vasari?" "Why would you want released from my service? you prejudiced against sheep or something?" I think this answers everything! Edit: It appears that the service I use resets the pic every time I log into it. Sorry. So I will just leave the text as is with a link if you want the pic. Ignore the grammar errors, even robots aren't perfect. Dang. Okay. Thank you for pointing this out to me, I will get it to work. So... they are being chased by omnipotent space sheep? Deep thought: So sheep are somewhat like drones. The closest thing to drones may possibly be the nanites? So the nanites are gaining sentience and overwhelming the outer sectors!? I think cleverbot is insane and is planning to take over the world. And become a sheep. I think everyone on these forums should smoke more weed. Just tried this myself, interesting results. That pretty much trumps my space sheep! I asked again, and it said "Chad is the boy I love." I think it's on to us and is just trolling us now. Quick! Give it Sheep Gifts! I'll hav yu kno tha i hve nevr... what? I was tiping sumting. I like sheep. Space Ponies and Space Sheep ... coincidence? Creatures that act like sheep are chasing the Vasari. 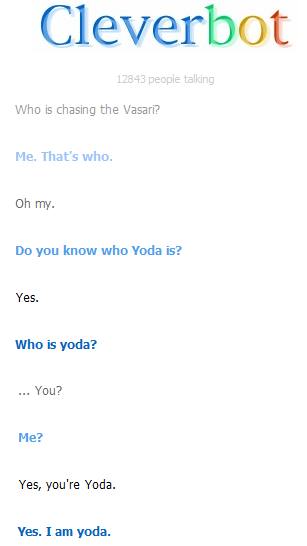 Cleverbot claims to be Yoda, and claims to be chasing the Vasari. It is confirmed that Space Ponies are chasing the Vasari. So, Yoda, an artificial intelligence construct, is a Space Pony that is chasing the Vasari with other like minded creatures/constructs that act like sheep. Does that sound about right? Especially the 'Do or Do Not. There is no Try.' mentality that machines seem to have. I demand that Ironclad release the new faction consisting of magical space sheep pony yodalings vikings IMMEDIATELY! ... I don't suppose there are any ambitious artists amongst us, are there? The screenshot is proof enough. These Yoda Sheep Magical Pony Vikings are coming to Earth. And they won't stop until every TEC, Advent, and Vasari child/larva is dead. We must prepare. We must mobilize. Must put aside our petty differences. Yeah sure we outcast the Advent 1000 years ago. Sorry. And sure Vasari are freaky xenos, but we can forgive that. But once you've seen what I've seen- a sheep eat a man whole while saying "Baaa or baaa not, LASER PEW PEW EYES say I!" We must stand together, three against one. The sheep are on fire!!! Let's not go that direction. Yeah, lets just keep it at that sheep (except for the face) has some major hotness going on. But for heavens sake its not on fire. That would be a horrifying waste of a bodysuit.